Over one billion glass bottles and jars were recycled in the past year alone; as a result during this period in excess of 225 000 tons of carbon emissions were saved simply by recycling glass. We thank all of our partners, entrepreneurs and shareholders for supporting us and turning the tide against waste! We continue to demonstrate our ‘heart’ for glass! Thank you for being as passionate as we are in ensuring all South Africans appreciate the value of recycling glass and actively embrace this practice. As the year draws to an end, this is the time to reflect on the wonderful work we have accomplished together in 2015. The team at TGRC would like to wish our recyclers a peaceful and happy festive season. 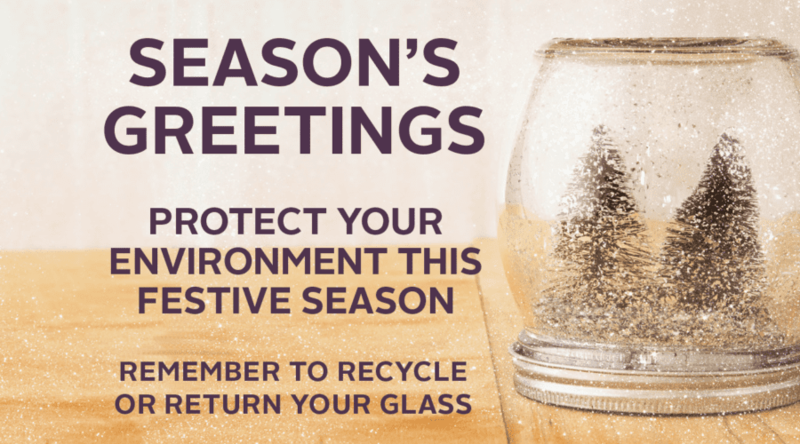 Remember to continue recycling your glass over this period as it can be a time when high volumes of glass bottles and jars are thrown away.